Weighty Matters: Consumers ignore the fine print when considering the health risks of fortified foods. Consumers ignore the fine print when considering the health risks of fortified foods. While this was far from an easy paper to read, its results are important nonetheless. Researchers in France set out to determine the impact on purchasing behaviour that health claims, health risks and scientific uncertainty had when posted on yogurts. 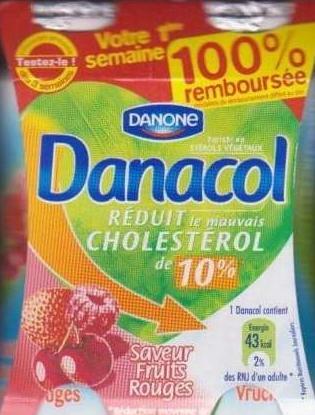 The study used Danacol, a Danone yogurt that's enriched with plant sterols and marketed as a means to help lower cholesterol. The subjects included folks with and without cholesterol problems and they were asked to compare taste and what they were willing to pay for 6 cups of the sterol enriched yogurt knowing the retail price for a comparable plain yogurt. The taste testing was blind whereby the yogurts' containers were covered with aluminum foil. Once taste testing was completed subjects were provided with information regarding phytosterols in general and then asked what they were willing to pay for the enriched yogurt as compared with plain yogurt. They were then provided information about health risks and scientific uncertainty associated with phytosterols and then asked again what they'd be willing to pay. The results I'm sure made every food marketer's day. While messaging of health benefits positively skewed purchase price, even among folks without cholesterol problems, health risk and scientific uncertainty messaging only had an impact on those without cholesterol issues, but rather than bring the price a person'd be willing to pay down to zero (which you might expect given there's risk reported and they don't have a cholesterol problem) they reported they'd still buy it, just not at an inflated price with a bizarre 38% of them reporting that they would in fact, eat Danacol in the future, despite not having cholesterol problems and despite being aware of the health risks and scientific uncertainties associated with phytosterols. Ultimately this article served to prove, at least in the case of yogurt, that health claims sell and more importantly, that the little bits of fine print that describe how there's scientific uncertainty and even risks associated with the products, don't discourage their consumption. A shame that the article is so painful to read as I do think the results, though not surprising, are important and something that governments should bear in mind when considering the regulation of fortified foods and their consequent health claims.